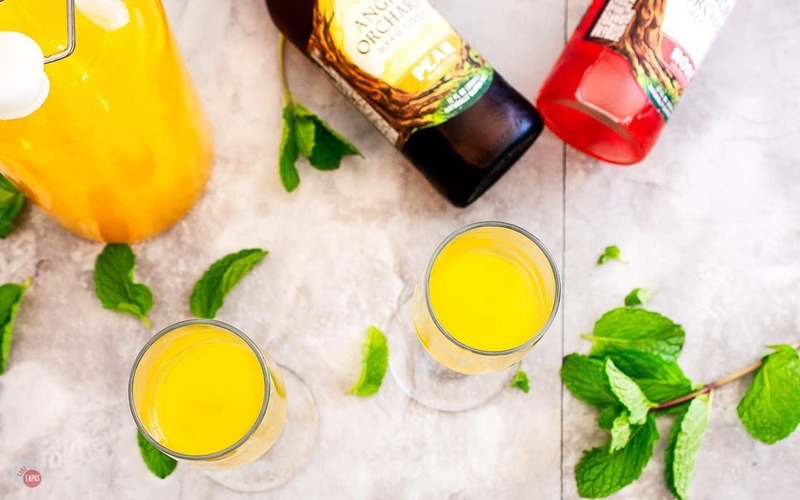 A new way to enjoy mimosas at brunch is with hard cider instead of champagne. 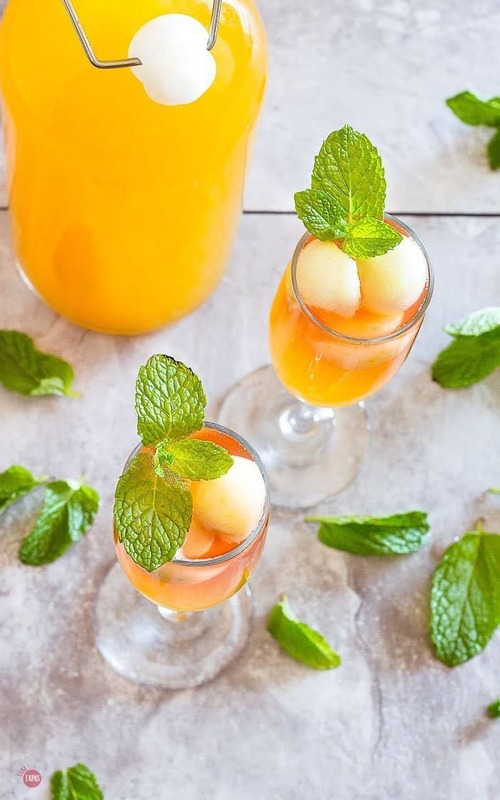 This Cider Mimosa is a refreshing combination of Rosé Hard Cider and Orange Pineapple Juice that is fresh new take on a classic! Before we can talk about this new twist on a classic breakfast alcoholic drink, we must talk about the original. When you ask this question you might get a funny look. Everyone I am friends with knows what’s in a mimosa, and how you make one. Simple! It’s orange juice and champagne, numbskull. Well, that is true to some degree. 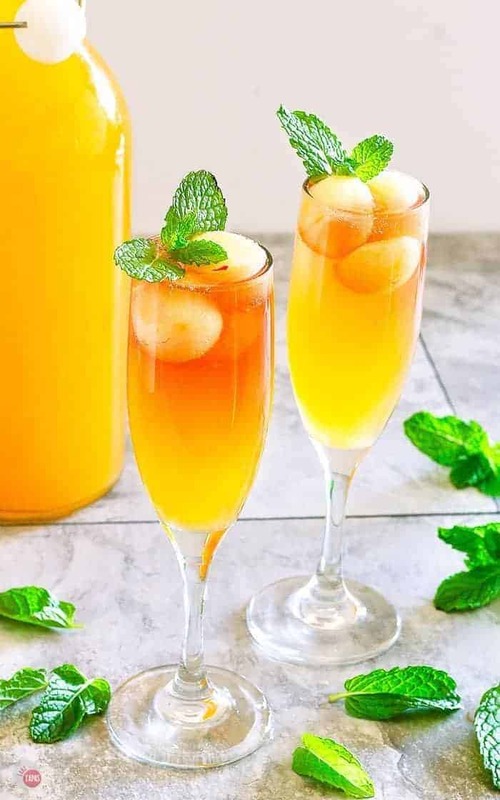 A mimosa is a cocktail that is one part champagne and one part citrus juice. Usually orange juice but that doesn’t mean that you can only make a mimosa using orange juice. This recipe is for a mimosa that is made with a new juice blend. And I couldn’t stop messing with it at that point, I had to go a step farther, and mess with the champagne part too. Just take me to the Cider Mimosa Recipe Already! 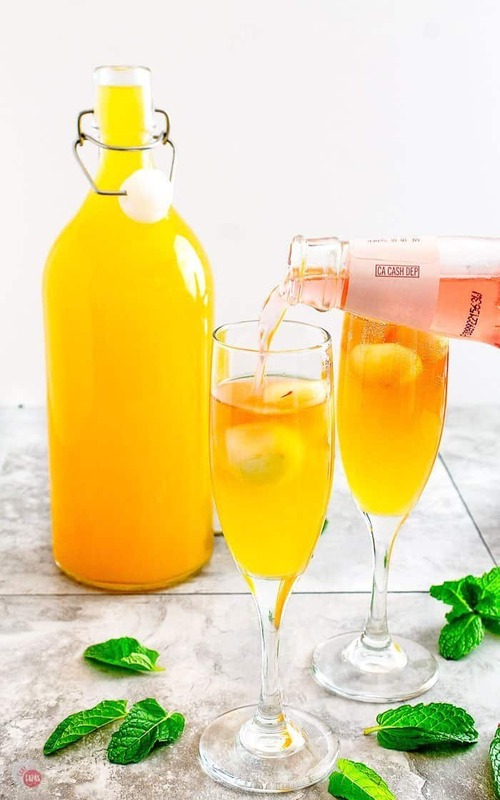 If you’d rather skip my (very helpful, I think) tips and tricks, essential cooking info, and similar recipe ideas – and get straight to this delicious easy Rosé Cider Mimosa recipe – simply scroll to the bottom of the page where you can find the printable recipe card. Last month I turned a margarita on it’s head and made one with beer instead of tequila so I am continuing the tradition and substituting hard cider for the champs. The real reason is champagne gives me a headache so I went with something I can drink without the side effects. Hard cider is an alcoholic beverage made by fermenting apple juice. It is definitely sweeter than beer but for me it is easier on the tongue than champagne. It does have the bubbles that are needed to bring the flavors of the juice to the forefront. There are plenty of brands and types of hard cider including pear, crisp apple, dry, and even cherry blossom. I’m a sucker for Rosé so I thought I would use this variety of cider for my cider mimosa. Plus the pinkish/red color of the cider looks very pretty with the orange/yellow color of the juice. Is this just an Apple Cider Mimosa? Technically yes, because the Rosé Hard Cider is made with rare red flesh apples that give it the pretty pink color. And it is mixed with a citrus juice. But not plain old orange juice. Because cider is made from apples, I thought it only appropriate to use a juice blend. One with the citrus juice necessary for it to be called a mimosa, and one that pairs well with the crisp apple flavors in the cider. And because of the higher sugar content of cider over champagne, I chose a lower sugar juice blend. One that struck my fancy is an orange pineapple apple blend with lower sugar content. The pineapple and orange juices give you the mimosa experience and the additional apple juice helps that flavors to blend together. Feel free to use what every juice blend strikes your fancy! 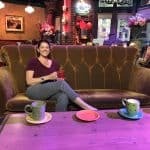 Q: Can I use any juice blend? A: Yes, feel free to use a juice blend that has your favorite flavors. Q: What is the best Hard Cider brand to use? A: This is a subjective question based on your flavor preferences, but I use Angry Orchard Hard Cider Rosé variety. Q: Can I cary the ratios of cider to juice? Q: What should I use if I can’t find the Rosé variety? A: Feel free to use the pear flavor as it pairs well with the juice blend. Another fun part of this cider mimosa is the garnish. I always have apples, lemons, and limes in the house so when I was trying to figure out fun ways to garnish the cider mimosa I figured apples were the way to go! But apples brown easily and the champagne flutes have such a small opening to drink from I didn’t want a huge slice of apple sticking on the rim or floating in the glass. I made some “apple ball ice cubes” using a melon baller. Scooping out spheres of apple and freezing them beforehand makes a pretty garnish that doesn’t block your access to the cider mimosa AND keeps your cocktail chilled if you are a slow drinker in the morning time. Other great Cider Cocktail recipes to try! Looking for a great cocktail to make at a party your hosting? How about a quick appetizer you can make ahead of time for a get-together that you are attending and are already stressed to the max? Check out all my party recipes, to fit your special occasion! 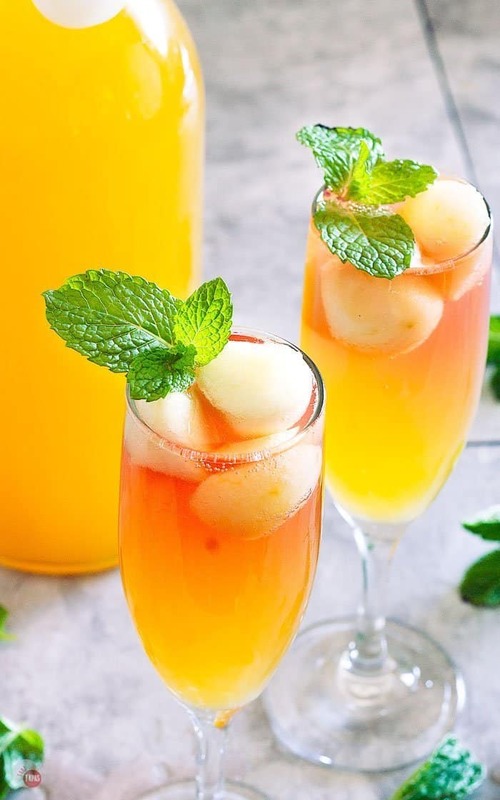 If you love this Rosé Cider Mimosa Recipe as much as I do, please write a five-star review in the comment section below (or on Pinterest with the “tried it” button – you can now add pictures into reviews, too! ), and be sure to help me share on facebook! 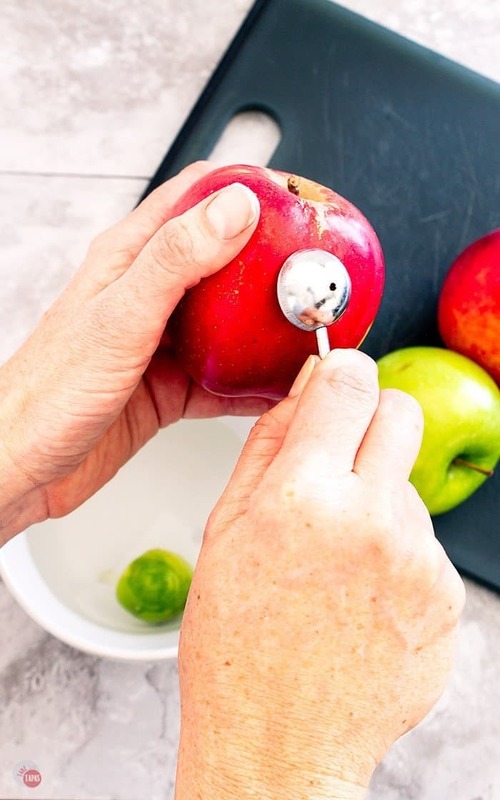 Using a melon baller, scoop out balls of apple and dip in water with lemon to prevent browning. Freeze them until ready to serve mimosas. 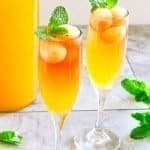 In your champagne flute, or other drinking glass, add 2 ounces of orange pineapple juice and 6 ounces of Rosé Hard Cider. I use Angry Orchard Brand for this one. Garnish with frozen apple ice cubes and a few sprigs of mint. These mimosas were a HIT! Just saw them yesterday and made them for brunch today. So dangerously good. Going to make them for my next holiday party, too!